Here they are! I only have one more group of 10 to show you after these! These are technically "November's" quilts! And here are the individual quilts from this group! I am still in shock that someone would donate that gorgeous paper pieced quilt top to us! Having done a little paper piecing, I know how much time and materials it took to make this beauty! It is the second one on the second row - also the top one on the pile pictured above. Otherwise, you've seen these styles before. It is obvious to all of you reading here by now that I was dreadfully behind on getting my tops quilted that my friend in AZ had sent me. She is a real workhorse - but works with no expectations from me. She is content to wait, - as I am, from her. With the last group of quilts - I actually took 30 to the church at once. No, you haven't seen all of these close up yet, but soon...very soon, I'll show the rest of them. 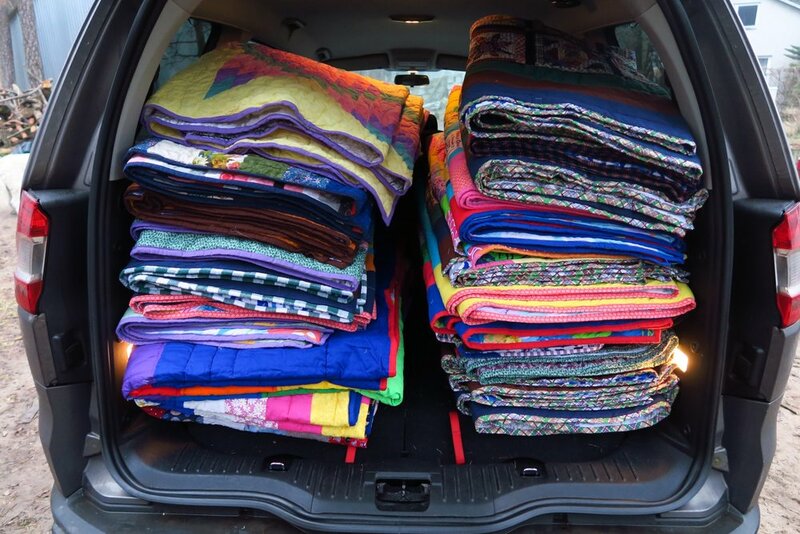 Just packing them into the vehicle was a hassle - I had just taken pictures of them so I had to refold them and of course, I wanted them all stacked neatly for a picture, but also for the building at church where they needed to be in a nice stack or they'd all fall over! These are 30 quilts here - I did the last 30 all in one bunch. And here they are after I stacked them up in the room. There are about 160 quilts in this picture. I did this over a week ago now and I popped back in that room a couple of days ago and they've not fallen over! Hopefully they are stacked well enough that it won't happen! And that's all for today from my part of the world! If you happen to need something for your own projects, be sure to check out what my sis has over in the store!